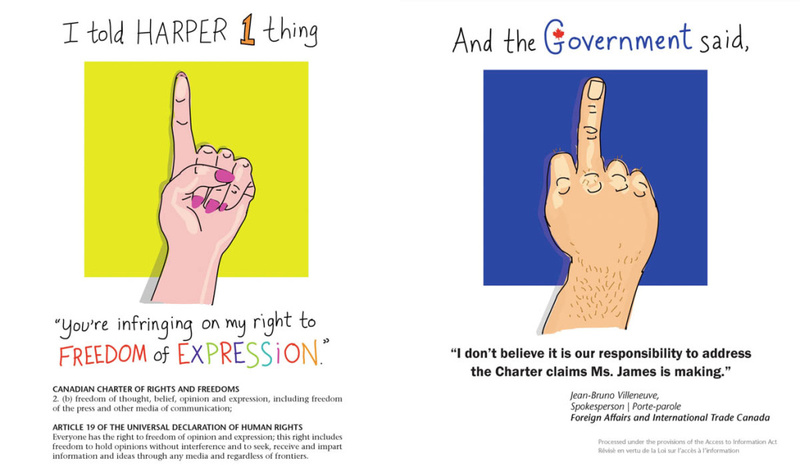 How does the Harper government crush free expression in Canada? It’s all too easy. Mix maniacal message control, far-reaching power, and the politics of hate all together and you have an industrial machine that crushes free expression — and then sweeps up after itself to cover its tracks. 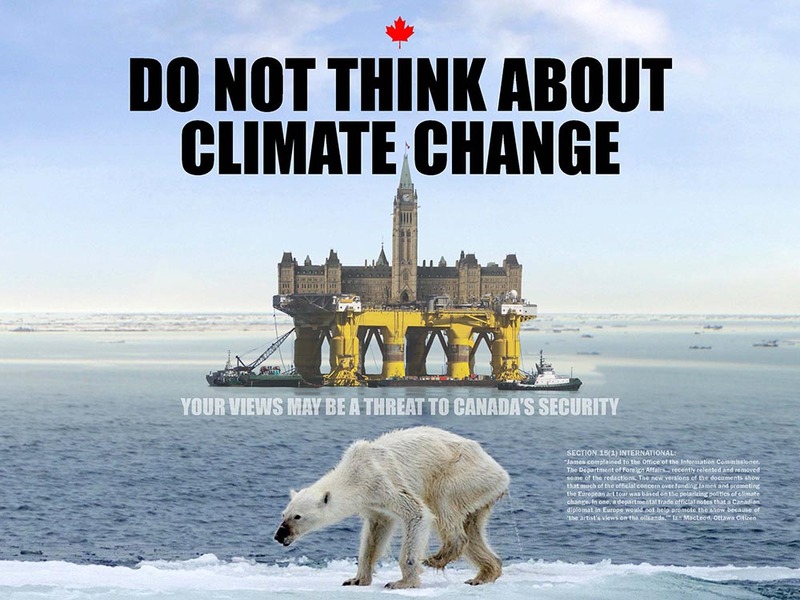 The Harper government targets anyone who thinks differently from them — and has the nerve to express those ideas. 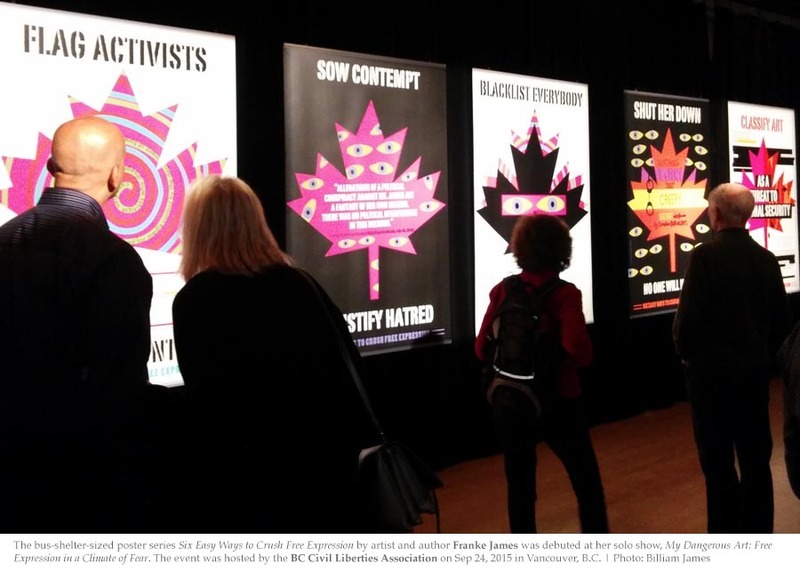 The Six Easy Ways is artwork I’ve created based on my experience of being blacklisted, monitored and censored by the Harper Government in 2011. Prior to that life-changing discovery, I took my right to freedom of expression for granted. After all, I live in Canada! I trusted that I could speak up and voice my opinions. But my experience shows that free expression is at grave risk, as high-ranking government officials including politically-appointed Ambassadors, warned people not to support me because my views on the oil sands run counter to (some) government policies. 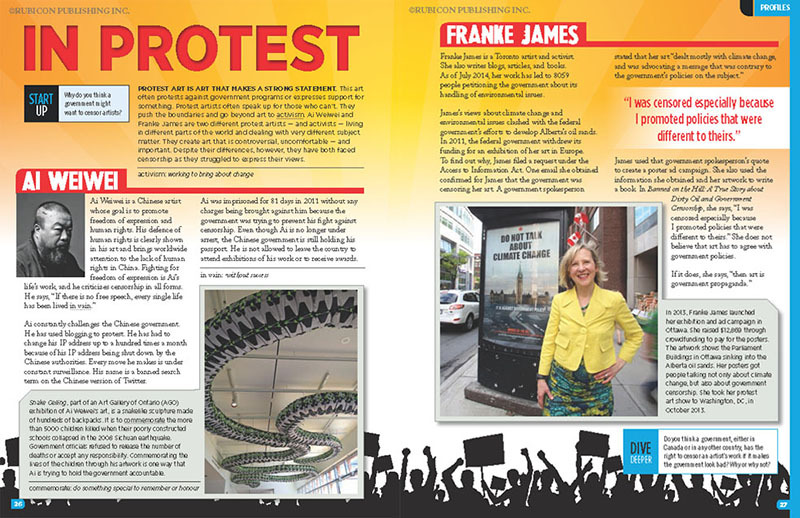 Their behind the scenes actions resulted in the cancellation of my 20-city art show in Europe — an exhibition which was intended to inspire students to take action on climate change. Thankfully, BC Civil Liberties and PEN Canada have both supported my right to free expression. 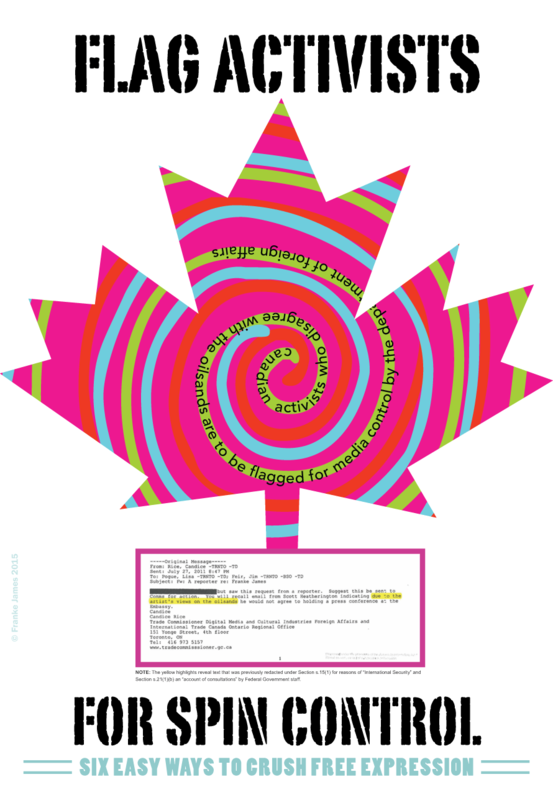 This poster features a letter from Canadian Ambassador Edwin Loughlin. The Ambassador is extending his ‘sincere’ regrets to Sandra Antonovic (my curator) that he could not support my climate change art show. In the top version of the letter, the reason he declined support has been hidden under a high-level clause. The Department of Foreign Affairs claimed that it was ‘redacted’ because it contained advice to a Minister or advice about government policy (S.21.1.a and b). But after I complained to the Office of the Information Commissioner, the OIC launched a high-level investigation. Two years elapsed before I received any findings — probably because the OIC’s budget has been slashed and there are only eight investigators who can peek under that high level of redaction. In the spring of 2015, I received Loughlin’s letter, unredacted*. *The OIC cannot order the government to remove the redactions. The only ‘stick’ the OIC has is that if they cannot mutually agree, the OIC can take the government to court. The OIC — our watchdog on access to information — needs to be given teeth that can bite! So what was that advice from the Ambassador that was so serious it had to be hidden? I must say when I read that line, I burst out laughing. But, aside from the utter stupidity of Loughlin writing down that he can’t write it down, we have a more sinister fact. Ambassador Loughlin was telling my curator — without my knowledge — that the government’s decision not to support my art show could not be put in writing for mysterious reasons that he couldn’t even write down! Wouldn’t that scare the bejeezus out of you? It smells like a smear tactic to me but the warning was unmistakable: What’s going on behind the scenes between Franke James and the Harper Government is so serious we can’t even talk about it! No wonder Antonovic published this “Bully in the Playground” statement on the cancellation of my art show saying she’d been intimidated by the Canadian government. This poster is called “Flag Activists” because that is what Commissioner Rice is doing — she is flagging me for spin control because of my views on the oilsands. Her email asks that the Canadian Government’s Communication team in Ottawa be alerted. This is a prime example of a government so hell-bent on message control they will even target “views” which are contrary to government policy. It’s also important to note that this email was written four years ago. When I originally got Rice’s email her statement “due to the artist’s views on the oilsands” was hidden under a high-level clause. If it wasn’t for the OIC’s efforts, it would never have been released to me in 2015. The government was purposely misusing its censorship powers to silence me. Classifying art as a ‘threat to National Security’ is the unbelievable and scary tactic the government is using to crush free expression. This poster features a heavily redacted email by Thomas Marr, the former Ambassador to Croatia. 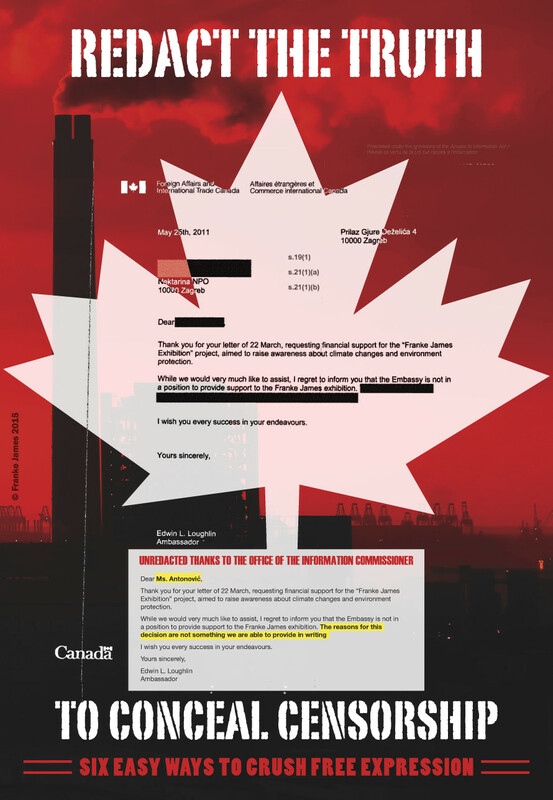 The email has the very undiplomatic subject line “Franke James is your fault?” See my visual essay about this extraordinary email and the creepy interference by Canadian bureaucrats. The shocking fact is that the Office of the Information Commissioner could not get this email unredacted — not even one word. The Harper government is still claiming that there would be injury to Canada if it was revealed what’s under those black redactions. This is ridiculous considering the “Franke James is your fault?” subject line — and it is chilling. When you know that Bill C-51 includes “economic” damage under the definition of security, you can begin to imagine what the government will do now that Bill C-51 is law. I imagine the Communication’s office in Ottawa toiled long hours to craft Foreign Affairs’ spokesperson Chris Day’s sound bite. His blanket statement that my claims are a “fantasy” is a devious attempt to sow contempt for me and justify hatred by the reader. Access to information documents revealed the sordid truth: high-ranking officials, from Ambassadors to Cabinet Relations bureaucrats were busy meddling behind the scenes. Foreign Affairs had cancelled funding for my show because my work dealt mostly with climate change and was advocating for a carbon tax and reduced emissions — anathema for Harper! Nektarina Non Profit believes that it is the right of every person – artists and intellectuals in particular – to freely express their opinion and to be able to pose the question about their government’s accountability on specific decisions. This is all the more important when such governmental decisions potentially impact the welfare of a large demographic, natural resources or both. 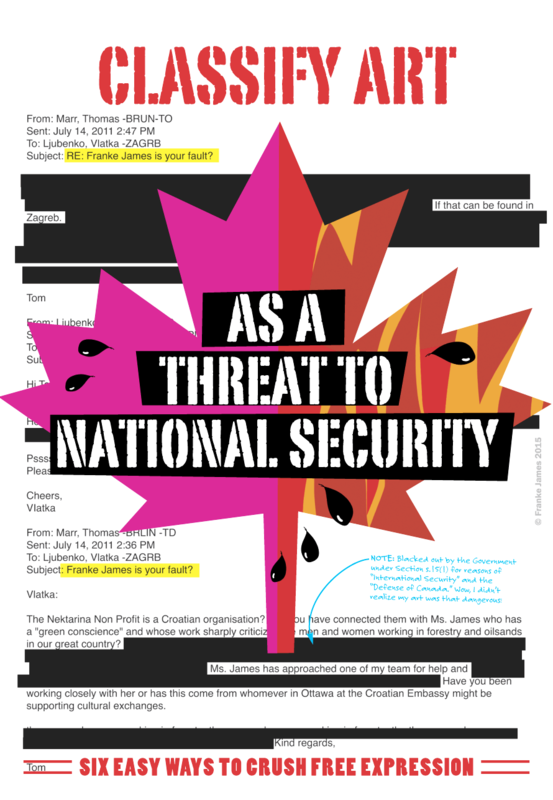 In 2013, the news that the Harper government had compiled “enemy” lists made headlines — of course the government refused to disclose exactly who was on it. 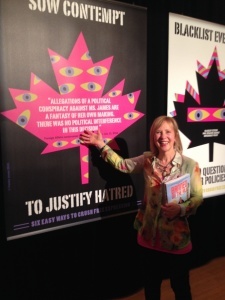 As the ‘blacklisted’ author of Banned on the Hill: A True Story about Dirty Oil and Government Censorship, it did NOT come as any shock to me that Prime Minister Harper keeps an ‪Enemy List‬. Putting people and organizations on a blacklist is an easy way to crush free expression because it has a ripple effect. There are many people and organizations who will keep their distance from anyone who is ‘blacklisted’ lest they be targeted too. In Freedom to Read 2013, the Governor General award-winning author and free expression expert, Charles Montpetit wrote “Return of the Blacklist” which discusses my case and goes on to cite others who have been muzzled, defunded, shut down or vilified by the Harper government. 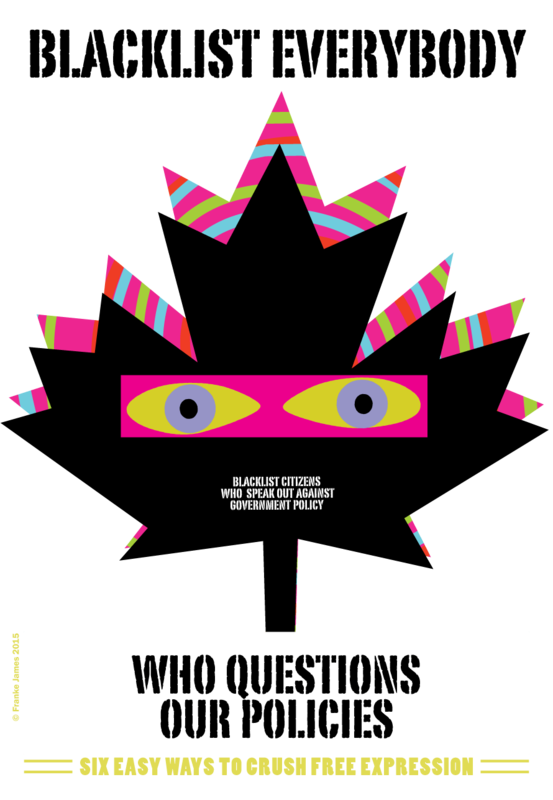 He points readers to Murray Dobbin’s extensive essay, Stephen Harper’s Hitlist: Power, Process and the Assault on Democracy and Mark Kennedy’s article “Harper’s Growing ‘Black List’ a Threat to Democracy: Critics“. Crushing Free Expression in Canada is Way Too Easy! How do we defend our right to freedom of expression when it is so very easy to crush it? We need a new government in Ottawa that is truly committed to allowing freedom of expression. But which party will stand up and protect our Charter right? Luckily — just in time for Canadians to vote on October 19, two non-partisan advocacy organizations have scored the parties on free expression. The Canadian Journalists for Free Expression has created a Free Expression Report Card: 2015 Federal Election Edition. The CJFE focused on six key aspects of freedom of expression “to lift the veil of secrecy that has descended on government and restore accountability and trust to our democracy”. They are the (1) Public Right to Know, (2) Bill C-51, (3) Privacy Rights, (4) Muzzling of Scientists, (5) Whistleblower Protection, and (6) Charitable Audits. Read their report. OpenMedia has also graded the parties on their commitment to freedom of expression. Their scorecard rates them on three points: respecting creator’s rights, prioritizing free expression and respecting the democratic process. 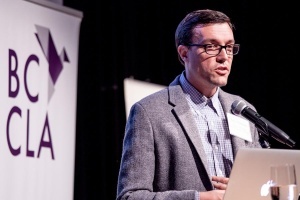 Key policy issues were the parties stances on Bill C-51, the Trans Pacific Partnership, and Copyright. Both the CJFE and Open Media ranked the Conservatives at the bottom of the class (ranging from D to F) on all points. The NDP and the Green Party averaged the best scores. But the Gold test for free expression is how the parties behave in the real world. Thankfully the next generation is debating it in schools. Mark Bourrie: Kill the Messengers: Stephen Harper’s Assault on Your Right to Know: a scathing indictment of the Harper government and what they will do to silence dissenting opinions and keep the Conservatives in power.